"The Gods envy us. They envy us because we're mortal, because any moment might be our last. Everything is more beautiful because we're doomed." 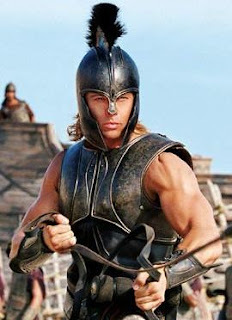 The characters of Achilles and Hector as depicted in the movie Troy - down to earth, realiastic and turned out to be substantially better then the demi-god like ones in Illiad. It made the real story or plot of the movie much more relevant and the movie didn't get lost in the myriad of special effect laiden ones. Probably that was the very reason that Wolfgang Petersen or David Benioff took the non-supernatural approach. The dialogue quoted above was particularly impressive and I guess its pretty much the heart of the movie and thats what this blog is about (more focused Troy review probably later). "Gods Envy Us" - So, who would want to be such a creature??!! Omnipresent, omnipotent, omniscient, omnivorous....no not omnivorous for sure (couldn't resist that one!). So who would want to be someone like that - perfect, everything within reach, no problems, no issues in life, everything satisfactory and peaceful, in complete bliss, nothing to do, nothing to hope for. "The Gods envy us. They envy us because we're mortal, because any moment might be our last. Everything is more beautiful because we're doomed. You will never be lovelier than you are now. We will never be here again." "Messenger Boy: The Thesselonian you're fighting... he's the biggest man i've ever seen. I wouldn't want to fight him. Achilles: Thats why no-one will remember your name. "